Over the years, kitchens have evolved based on the wants and demands of the people. In todays on-the go family, the kitchen should be proficient to multitask as well. After a lengthy day at work, kitchen is the place where family members get together to catch up on the events of the day as they put together a meal jointly. No longer is the kitchen merely a place where food is made and eaten. Therefore if you are seeking to refashion your existing kitchen or recreating a new kitchen, it is essential that you are aware of the evolution that has taken place in kitchen designs and kitchen furniture over the years. Kitchen appliances are no longer limited to the conventional stoves and refrigerators; they now include a wide variety of gadgets that would equal any commercial kitchen. Cookers, freezers, refrigerators and dishwashers now include so many features that it is imperative that kitchens are planned well so as to maximize comfort and utility. Trendy kitchen furniture components available today are a far cry from those seen in your grandmothers' houses. In today's world, appearance of kitchen furniture is as important as functionality. 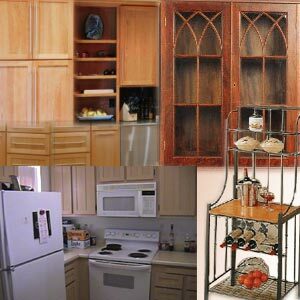 Cupboards and cabinets come in a wide range of colors and materials. Sinks are no longer used only for cleaning and washing utensils; they reflect the kitchens decor and are available in various designs. With the trendy sinks available you might not even want to use them as a cleaning place. Kitchen furniture includes a broad array of items. From tables and bar stools to wine racks and cabinets, there are exciting models to pick from. The accessories that you choose for your kitchen must complement your kitchen decor as well as the rest of your house. Decide on the wall color and place your fridge, counters and cabinets based on their color and size. Set up the biggest accessories first and then work on the smaller ones. Don't forget the clock on the kitchen wall. Hoods are available in designer pieces and help keep the smoke and odor out. If your culinary skills are well honed, then fit in the pot racks and bakers rack without fail. Install a wine rack if you have a wide collection. Chopping blocks and countertops are intrinsic to any kitchen plan. Kitchen racks and worktables are always useful and can be made as foldable ones that can be slipped under the counter after use. Designer sinks, knobs, cabinet accessories lend the kitchen a classy look. Backsplash and stainless steel accessories find place in a modern trendy kitchen. Decorative panels can be used to enhance the overall decor. Fully fitted kitchen: Maximum space can be utilized from the kitchen using this type of kitchen furniture. The units can be assembled at the manufacturers place and can directly fit into the kitchen. Easy to fit and particularly suitable for corner space, such kitchen furniture cannot be easily removed when required. Freestanding kitchen furniture: This type of kitchen consists of individual pieces of furniture for explicit errands and is gaining popularity in the recent times. The convenience of this furniture is that it can be moved any where but has the draw back of not utilizing the storage space to its fullest. Factory built rigid kitchen furniture: This type of furniture is usually glued and doweled or assembled with metal cam and dowel fittings. The options offered are vast and thereby there is scope for design flexibility. Flat packed or self assembled furniture: This type of kitchen furniture has been developed mainly to add momentum to the supply chain and to reduce costs. This furniture is popular in the U.S. and the U.K.
Bespoke kitchen: This type of kitchen furniture allows you to choose and design your own kitchen. Different ranges are in offer and are custom designed for any type of kitchen. The pricing is higher when compared to others. An innovative kitchen will perhaps be the one of the most luxurious purchases you are going to make for your home. It is very important to take some time out to explore on all the products and the companies that are available in the market. Pull out some magazines, browse through some well-known web sites and collect valuable information on different makes, styles, pricing and suitability. Make out your wish list and include all that you would want to purchase. For e.g. dishwasher, extra wide pan storage drawers, split level cooking and more. Before you purchase kitchen furniture, consult with a kitchen specialist. He will be able to guide you with your requirements from among all that is available. All of us get carried away by the looks that include the style, color, finish and budget but what is most important while choosing kitchen furniture is the durability, strength and the functionality of the product. Kitchens are expensive and thus care should be taken to avoid or minimize mistakes during pre-purchase stages. Ensure that the kitchen furniture that is being purchased will get its full use after installation and that you make use of the space available in the best possible manner. With appropriate kitchen island furniture, your cooking and kitchen experience can be made more fun. With new kitchen island furniture fixed, don't be surprised to find the family queuing up to help you. With a kitchen island in your kitchen, you don't have to run about for cutting boards, pans and cutlery. Instead you can keep them in the storage space provided in the island and can retrieve them as and when required. If your kitchen is small, a kitchen island can give you the added countertop space and storage space that you so badly require. Kitchen islands also come with wheels and can be moved around as per convenience. Moving appliances becomes a lot easier with these types of kitchen islands. Kitchen islands also come in a variety of shapes and sizes and with the options of foldable counters too. Kitchen islands can be purchased readymade or custom-built.